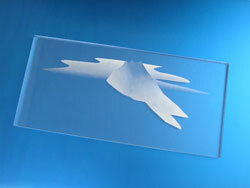 Are you looking for a way to give your acrylic engravings more depth? 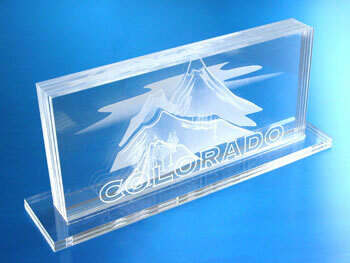 The Multi-Level Colorado Mountain Scene is a perfect example of how using engraved layers will give your acrylic awards and trophies the 3D qualities you have been looking for. 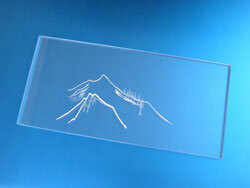 Using engraved layers will make your pieces look like the engraving is actually inside the acrylic. 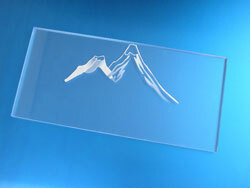 Follow the simple steps below and create your own multi-level Colorado Mountain Scene. We used a 35-watt Mini 24 with the following settings: 50% speed, 80% power for engraving and 3% speed, 100% power, 5000 frequency for cutting. The colorado3d.cdr file contains all the cut and engraved pieces necessary for your 3d layered sample, so be sure to click the combined mode button in the driver window. 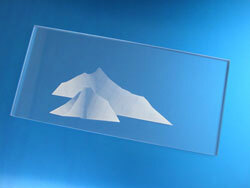 Notes: When engraving and cutting acrylic, it is a good idea to mask off the top side to prevent the smoke and acrylic dust from sticking to the surface of the acrylic. Use a semi-tacky masking tape. 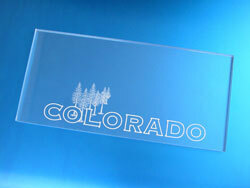 After the laser has finished cutting and engraving, use the order of the pictures to the right to assemble your colorado3D sample. The order of the photos is from front to back. Glue Instructions: First glue the base for the colorado3D sample together using the acrylic glue. 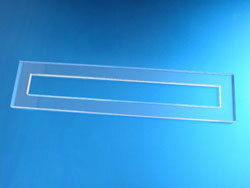 The rectangle with the cut-out goes on top. When gluing the layers of the colorado3d sample to the base, only place glue on the parts of the layers that will be touching the base.